NEW ORLEANS IS FULL OF DETAILS. There was a fire on Baronne Street this morning. Most people who visit New Orleans think Baronne Street is a street in the Central Business District, what we call the CBD here. Baronne Street, like all New Orleans streets is very, very long and has different shades and flavors as it wends its way parallel to the Mississippi River that gives the Crescent City its shape and distinctive street grid. I ran into Charlie at the gym this morning and he told me there was a 5-alarm fire on Baronne. “Where?” I asked. “Right past the Muses” he told me. What does that mean to you? Right past the Muses. We speak our own language in New Orleans, a particular language that is tied to geography and traditions. If you are bored in New Orleans, you have a hole in your imagination. The Muses Streets are streets Uptown that are named after the Nine Muses in Greek mythology. They are Calliope, Clio, Euturpe, Erato, Melpomene, Terpsichore, Polymnia, Thalia, and Urania. Many of the streets aren’t pronounced the way you would expect. A new apartment complex was built after Hurricane Katrina in Central City and it is named the Muses. That is where the fire was, right off the next street after the Muses, Felicity Street. Felicity Street is one of the few remaining streets that is paved with cobblestones rather than asphalt. Don’t ask me why. The other cobblestone street in the city is Bayou Road, the oldest street in the city. Bayou Road is paved over with brick nowadays, over the paving stones. The city laid the brick pavers about two years ago. How do I know? Because the oldest street in the city crosses Esplanade Avenue diagonally right in front of La Belle Esplanade. If I digress it is because I cannot help myself. No New Orleans story, like no New Orleans journey, goes in a straight line. Ours is a city full of diversions and asides. Things will capture your attention and waylay you so that you are lost in familiarly enchanting cityscapes wherever you may happen to be. Bloom where you are planted. New Orleans is a many-splendored place. Life is short. New Orleans is long. I could go on and on about the fire on Baronne Street this morning and still not get to the point of this story. Like most stories in this magical city we call home, the point is not the goal so much as the telling and the being in place. You can get lost in New Orleans yet you will still always find yourself at home. New Orleans is a city with miles and miles of heart. Come visit and see for yourself. The old firehouse on St. Roch Avenue in the St. Roch neighborhood. When you’ve decided when you are able to visit this wonderful city we call home, fill your dates into our calendar to see what we have available. We only have five suites so only the most microscopic fraction of the 18 million people who visit New Orleans every year can have the La Belle Esplanade experience. No one ever says their visit is too long. It is always too short because the longer you are here, the more you’ll realize how much more there is to discover and explore. I always say that five nights is the perfect amount of time to get a satisfying taste of New Orleans. More is always better. Monday, March 25, 2019:. I’d tell you all the things today but it was a lot. 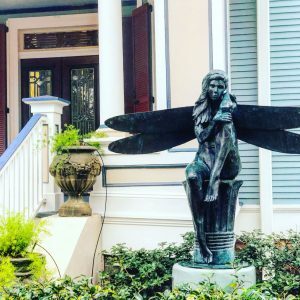 I went to Metarie, to Old Metarie, to Lakeview, to Lake Vista, to Cafe Minh, to Mid-City, and, of course, I spend a lot of time on the most beautiful street (n my opinion) in all of New Orleans: the one and only Esplanade Avenue. We live on a beautiful street and good memories are made on Esplanade Avenue every day. I know. I make good memories that will last me the rest of my life every day. You should, too. —À votre santé, nos amis!! !